Housed in the observatory dome is a 24-inch (f/4.8) Newtonian reflector telescope. The telescope was built by Steven Swayze of Portland. The tube sections are made from laminated hardwood and are connected by square-section aluminum trusses. The 500-pound tube assembly rests in a Dobsonian-style mount riding on Teflon "O" pads which allows full movement with just hand pressure. The mount sits on a motor-driven, nested-cone equatorial table which allows tracking of objects for up to 45 minutes without adjustment. 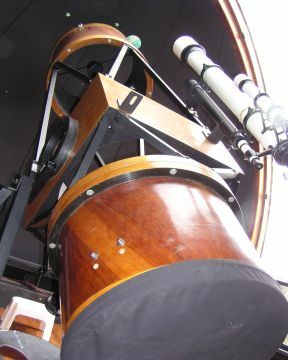 The equatorial table was designed and fabricated by the Danziger Telescope Group in Santa Fe, Texas. 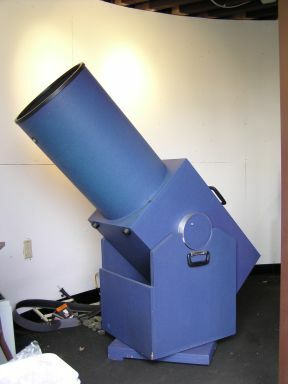 Mounted on the main telescope and (more or less) aligned with it, is a 6" refractor. The refractor often gives us our sharpest images of bright objects such as planets and binary stars. A telrad finder is used for locating the general location of an object and guiding the main telescope to the object. A 13" Dobsonian reflector telescope is located in the tower and can be rolled out onto the tower deck. "Big Blue" is on loan from the CCC Science Department. This telescope is more suitable for looking at objects high in the sky and observing without having to climb more stairs or a ladder.